“You Me Bullets Love” is a new album by the Australian band The Bombay Royale from Melbourne, who specialise in bringing to life - and to the live stage - versions of many of the classics of India’s Bollywood film industry. The album (on Hope Street Recordings) is a 10 track CD/DL/Vinyl that showcases old songs such as the 1965 chestnut “Jaan Pehechan Ho” (from the film "Gumnaam") as well as entirely new pieces done 'in the style of' . The ‘golden years’ for Bollywood films are often cited as the 60s and 70s and The Bombay Royale mix these old songs (in Hindi and Bengali) with newer material they have written themselves (including some with English lyrics) inspired by these classic masterpieces. At times the whole album sounds as if someone’s taken a giant cocktail shaker and thrown in some vintage 50s, 60s and 70s Bombay kitsch, a shot of James Bond, a gaggle of Go-Go girls, two slices of Eddie Cochran and Gene Vincent, a pinch of Massive Attack, the serried ranks of saxophones, trumpets and trombones, a veritable forest of violins and yards and yards of orange, pink and turquoise silk, and then recorded the whole lot via the audio-equivalent of a Kodak Instamatic shot through a Dub filter. Someone with more knowledge of Hindi music would probably be able to pick up on the Bollywood strands better than me, but that’s about as near as I can get to it at the moment! One of the Australian papers described it as being “where A R Rahman and Ennio Morricone converge, where Slumdog Millionaire meets Goldfinger head on, with Quentin Tarantino and Indiana Jones lurking in the corner”. The vocalists are Parvyn Kaur Singh and Shourov Bhattacharya. The MD is Andy Williamson. 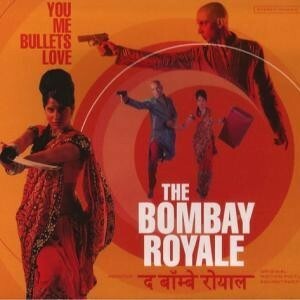 “You Me Bullets Love” is a whole lot of fun. A lot of it is, I’m sure, very tongue-in-cheek, but then again so is much of Bollywood, and it plays with all those elements of East meets West meets East again (and in the case of Australia, meets South). 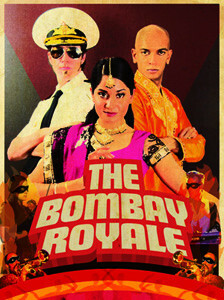 So, if you like Bollywood music, or surf music, or the 60s, or trippy music, or just have a predilection for multicoloured kitsch and musical cheese to let your hair down to and shake your thang, then book yourself a night at The Bombay Royale.